This year’s $1 million TED prize winner, Sarah Parcak, space archaeologist, was recently explaining spectral imaging and infrared imaging to Stephen Colbert. Her prize winning talk included an explanation of how she extracted archeological information, outlines of undiscovered ruins, pyramids and towns, from spectral changes in high-resolution NASA satellite imagery. 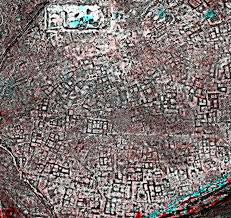 Data treatments familiar to practitioners of hyperspectral imaging helped her to discover 17 potential pyramids, 3100 forgotten settlements and 1000 lost tombs. Subtle spectral changes in vegetation help identify moisture deficiency, the need for fertilizer application and other health metrics of crops, such as diseased or infested areas. Dr. Parcak’s research of finding particular shapes indicative of early human settlements or buildings is a particularly a good application of spectral imaging where the emerging shapes cannot be seen in RGB images. The most useful applications of spectral and hyperspectral imaging involve seeking not just composition but shapes revealed by the processed spectral data, such as high-speed sorting of food and agricultural products, finding defects in industrial production or identifying a certain mineral zone in a mine or from core samples. We are glad her work elevated spectral imaging and the use of the longer-than-visible wavelength region in the eyes of the public!